Cambrian College in Sudbury, Ont. is recovering from a ransomware computer attack, in which hackers held files hostage in exchange for approximately $54,000 in electronic currency or 30 bitcoins. Cambrian College in Sudbury, Ont., is recovering from a ransomware computer attack, CBC News has learned. 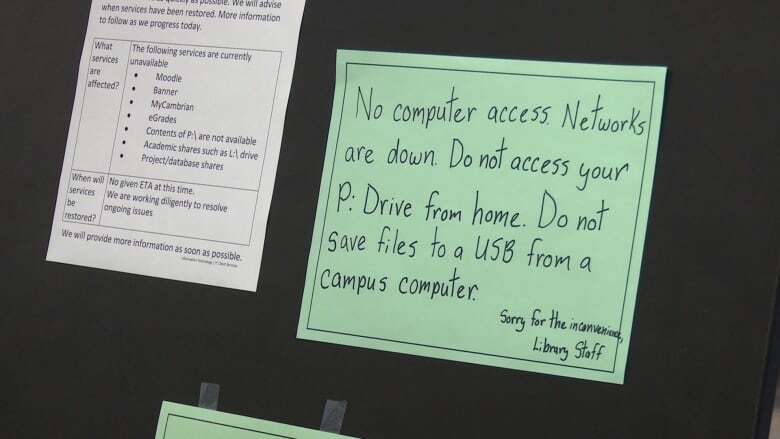 A virus encrypted a significant portion of the school's online network last Thursday, according to the administration, and hackers held files hostage in exchange for approximately $54,000 or 30 bitcoins — an electronic currency. The college has not paid the ransom yet, as the situation is still evolving, said Shawn Poland, associate vice president of college advancement and strategic enrolment. "Thanks to the tremendous and talented work of our IT team and our cyber security consultants, we've been able to assess the damage and bring those networks and files back on stream," Poland said. "We are in containment and recovery mode, and to this point in time that effort has gone relatively well." The hack targeted Cambrian's web portals, grade report and student learning management systems where assignments are submitted. "It's kind of frustrating," police foundation student Allain Lendrum said. "None of us can see our grades. Also, I'm taking a couple of classes this summer and now I can't access those." Students were supposed to receive their final marks on Wed. May 3, but that date has been pushed back to Sat. May 6 around noon. Assignment deadlines have been given extensions. Registration for the spring semester has also been postponed and will now open on Sun. May 7, at 10 a.m.
"Really, we wanted to make sure that no student or staff member was penalized as a result of the virus," Poland said. Student and academic systems are being prioritized. So far, myCambrian, Moodle, and eGrades are restored. Faculty have been able to enter grades remotely or in dedicated labs. Poland said the college does not know how the virus infected the college's system, but police have been notified. "Cambrian's systems, while they have been compromised, have received considerable investment," Poland said. "While the investigation is ongoing, to this point in time we are at least comfortable enough and we will communicate further information as it becomes available."